SCOTTSDALE, Ariz., Oct. 2, 2018 /PRNewswire/ -- Taylor Morrison Home Corporation (NYSE: TMHC), a national homebuilder and developer, today announced the closing of its acquisition of AV Homes (NASDAQ: AVHI). The complementary land and community portfolio AV Homes offers marks a significant new phase in Taylor Morrison's growth strategy. The combined company is expected to generate approximately $5 billion in revenue in 2018, with a portfolio of approximately 54,000 owned and controlled lots and 350 active selling communities at time of close. In 2017, Taylor Morrison and AV Homes closed 8,032 homes and 2,491 homes, respectively. "When we set our sights on growing our business, we were looking for a builder whose footprint overlaid neatly with ours and could take us deeper into the top housing markets we operate in today," said Sheryl Palmer, Taylor Morrison chairman and CEO. "This deal represents a leap forward at a time when macro fundamentals favor housing and support Taylor Morrison's smart-growth roadmap. The combined business broadens our target market with more options for first-time and 55-plus buyers, two consumer groups AV Homes served well." Growth in the more affordable first-time buyer segment—including growing the affordable active adult product offerings—forms a key component of the company's long-term vision. The improved range of affordable options follows the homebuilder's independent market research that revealed significant consumer demand for balancing home price with lifestyle and experiences. 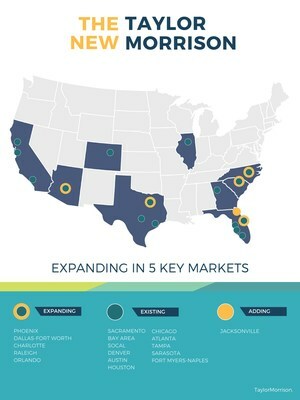 The deal expands Taylor Morrison's local scale and market share in five in-demand overlapping markets, boosting its status from top 10 builder to top five or higher in Phoenix, Dallas-Ft. Worth, Charlotte, Raleigh and Orlando. With greater access to scale efficiencies and a continued drive for operational excellence, the company anticipates top- and bottom-line performance improvement, in addition to synergies from overheads, increased mortgage capture rates and local and national purchasing opportunities. The acquisition of AV Homes increases Taylor Morrison's workforce by approximately 20 percent. The company's comprehensive integration plan is aimed at delivering a seamless employee onboarding experience while quickly capturing savings and operational efficiencies. "We are thrilled to welcome AV Homes team members to the Taylor Morrison family, and are excited to work together to make the transition into our culture, technology environment and operations as seamless and productive as possible," added Palmer. Throughout the integration process, the business will continue to focus on leveraging strategic growth to enhance the customer experience, including expanded affordability in core locations and a more personalized technology-enhanced homebuying journey. Citigroup Global Markets, Inc. served as the financial advisor to Taylor Morrison and Paul, Weiss, Rifkind, Wharton & Garrison LLP acted as Taylor Morrison's legal counsel. JP Morgan Securities LLC and Moelis & Company LLC served as the financial advisors to AV Homes and Wachtell, Lipton, Rosen & Katz acted as AV Homes' legal counsel. Such risks, uncertainties and other factors include, among other things: changes in general and local economic conditions (including as a result of recent extreme weather conditions); the inherent uncertainty associated with financial or other projections; the integration of Taylor Morrison and AV Homes and the ability to recognize the anticipated benefits from the combination of Taylor Morrison and AV Homes; unanticipated difficulties or expenditures relating to the transaction, the response of business partners and retention as a result of the announcement of the transaction; the anticipated size of the markets and continued demand for Taylor Morrison's and AV Homes' homes and the impact of competitive responses to the transaction; slowdowns or severe downturns in the housing market; homebuyers' ability to obtain suitable financing; increases in interest rates, taxes or government fees; impacts from the recently enacted tax reform legislation; shortages in, disruptions of and cost of labor; competition in our industry; any increase in unemployment or underemployment; inflation or deflation; the seasonality of our business; our ability to obtain additional performance, payment and completion surety bonds and letters of credit; higher cancellation rates; significant home warranty and construction defect claims; our reliance on subcontractors; failure to manage land acquisitions, inventory and development and construction processes; availability of land and lots; decreases in the market value of our land inventory; new or changes in government regulations and legal challenges; our compliance with environmental laws; our ability to sell mortgages we originate and claims on loans sold to third parties; governmental regulation applicable to our mortgage operations and title services business; the loss of any of our important commercial relationships; our ability to use deferred tax assets; raw materials and building supply shortages and price fluctuations; our concentration of significant operations in certain geographic areas; risks associated with our unconsolidated joint venture arrangements; information technology failures and data security breaches; costs to engage in and the success of future growth or expansion of our operations or acquisitions or disposals of businesses; costs associated with our defined benefit and defined contribution pension schemes; damages associated with any major health and safety incident; our ownership, leasing or occupation of land and the use of hazardous materials; material losses in excess of insurance limits; existing or future litigation, arbitration or other claims; negative publicity or poor relations with the residents of our communities; failure to recruit, retain and develop highly skilled, competent people; utility and resource shortages or rate fluctuations; constriction of the capital markets; risks related to our debt and the agreements governing such debt; our ability to access the capital markets; and risks related to our structure and organization. In addition, other such risks and uncertainties may be found in our most recent annual report on Form 10-K filed with the Securities and Exchange Commission (SEC) as such factors may be updated from time to time in our periodic filings with the SEC. We undertake no duty to update any forward-looking statement, whether as a result of new information, future events or changes in our expectations, except as required by applicable law.